How would you like to spend a day on a lovely little island in the Salish Sea?” That was the question I posed to a small group of friends in August, 2013. The answer was a resounding yes! 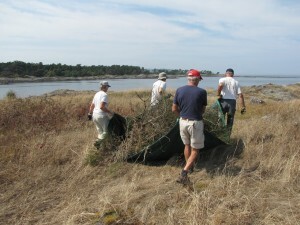 The object of the exercise was to rid the invasive Scotch Broom from a small, jewel of an island just off the coast of Victoria. Griffin Island has been designated as part of the Oak Bay Islands Ecological Reserve to preserve the natural meadow community and the rare plants that grow there. In Spring, the meadows are flush with wildflowers like Camas, Chocolate Lilies, and the rare California Buttercup. Over the years, Scotch Broom has encroached on one of the meadows and has shaded out many of these plants. It was time for something to be done. I have visited Trial Island several times to see the amazing work Matt Fairbarns and his crew have done to remove invasive species there. For more than ten years this crew has removed most of the broom and is now working on other invasive species such as Spurge-laurel and English ivy. Matt provided valuable information about invasive species removal techniques when we spoke about removing broom from Griffin Island. Armed with this knowledge, loppers and secateurs, I assembled a small group of friends for a day to see how much broom we could remove. With a lot of sweat equity, it was truly amazing how much broom this determined group of bashers dealt with in a relatively short time. We were able to get quite a bit of broom removed from the meadow in 2013 and went back again this year to tackle some more. By next year, we will have removed all of the large plants and will focus on the new growth. As broom seeds are viable in the soil for more than thirty years, it will take a long time (if ever) to have a completely broom free island. One of the most important things in broom removal is to return to the site every year to pull the new plants so they are unable to flower and produce more seeds. The crew is looking forward to next year! Many thanks to Joe Benning, and Hugh MacDonald from BC Parks, for providing crew transportation to the island and encouragement along the way.